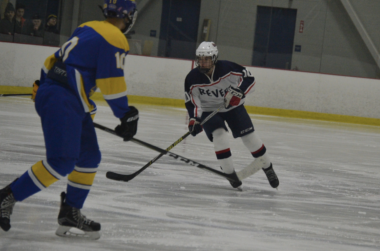 Junior Marc Giordano has been a member of the Malden-Revere Ice Hockey team for three years. He hopes to keep playing for the remaining of his years of high school. From a young age Giordano was brought into the sport, he mentioned that his father brought him to a Bruins games and from then on, he had continued to dedicate his time into ice hockey. He started playing Hockey himself since he was five. Giordano believes that he is better with being “on [his] feet and [he has] good hands”. He elaborated on that by explaining that he has good handling with the puck and passing to teammates, and better footwork on ice. Other than Hockey, Giordano also plays other sports such as golf in the fall season and lacrosse in the spring season. As both a student and a athlete, Giordano has some things in mind that he has set goals on. As an athlete, since the hockey team is very close in gaining a spot into States ,Giordano wants to be part of the push in helping is team get there. As a student, Giordano wants to keep improving his GPA and grades in school.